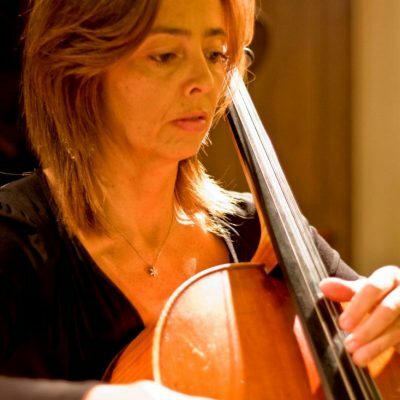 Claudia Ravetto studied cello with Sergio Patria at the Turin Conservatoire, graduating in 1988 with top marks. She continued her studies with Michael Flaksman at the Stuttgart and Mannheim Hochschules, obtaining masters’ diplomas from both institutions. As a soloist she was awarded the “Giovanni Camerana” and “Luigino Tandura” scholarships at the 10th Vittorio Veneto Cello Series 1988 , while in 1989 she won the Settembre Musica Prize in Turin and the linked master courses at Portogruaro. In 1992, as member of a cello-piano duo, she received 3rd prize at the International Chamber music competition at Caltanissetta. In 1993 she won a competition organised by the Mannheim Hochschule for the award of the loan of an instrument from the Baden-Wurttemberg collection, and in 1994 she won the European section, which allowed her to participate in the Piatigorsky Seminars at the Music department of the University of Southern California. From 1990-2005 she was the cellist of the Borciani String quartet, with which she performed at prestigious festivals and concert seasons throughout Italy(Settembre Musica , Turin, La Scala and the Società del Quartetto in Milan, the Venice Biennale to name but a few), as well as throughout Europe and the USA(for example, at Mozart festivals at the Mozarteum, Salzburg and in San Luis Obispo,California, the Chamber Music hall of the Bonn Beethoven House, the Purcell Room, London ). The quartet was chosen to play at a direct broadcasted concert at the Quirinale Palace in Rome in honour of the 80th anniversary of the founding of the RAI (Italian Radio) in the presence of the President of Italy, Carlo Azeglio Ciampi. Furthermore, with the Borciani quartet she has performed the complete cycle of Beethoven quartets at the Teatro Sociale in Como, as well as the complete Schumann quartets at the San Carlo Theatre Naples. The quartet’s large discography includes: Boccherini’s quartets Op 32 and Op 39 for Naxos, which won the Vivaldi prize of the Cini Foundation in Venice for best recording of the year 2001, a Schubert CD album for Amadeus, including the great G major quartet D 887 and the C major string quintet with the cellist Enrico Dindo , as well as various CDs of contemporary music for Stradivarius, including Donatoni’s The Heart’s Eye and Alessandro Solbiati’s Quartetto con Lied. After the dissolution of the Borciani Quartet, Claudia Ravetto founded the Verdi stirng quartet. She has given masterclasses in Italy, Madrid and in California, and currently holds the position of professor of Chamber Music for strings at the Giuseppe Verdi Conservatoire in Turin.